The I-X Indoor Amusement Park only opens a couple of times in a year, and if you miss it, well, we recommend you don't mention it to your kids. Inside the giant expo center next to Cleveland-Hopkins Airport, visitors find creative and unusual attractions, plus a host of expected rides, games, and shows featuring characters popular with kids. Featured shows and characters change with each iteration - watch the website for upcoming events, if you do not want to miss these exciting events. What we've found is that most kids love the rides and generally crazy atmosphere, and don't care what shows, if any, are being staged during a visit to the I-X Indoor Amusement Park. We recommend going early in the day, and avoiding the last weekend the park is open, as that's typically the most crowded. The extravaganza features ... kiddie rides. Some favorite rides include a giant slide, Mini Indy cars, and a balloon ride. I-X Indoor Amusement Park Admission Tickets are still not available for the year 2019. Please check back some time later for updates by clicking here. Other Specials & Coupons To view I-X Indoor Amusement Park Admission tickets, Discounts, other Specials and Coupons, go to their special page by clicking here. I-X Indoor Amusement Park updates this page throughout the year, so check back to see if new specials and coupons have come in. 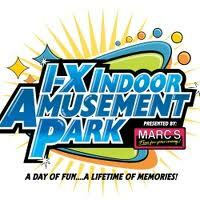 Note to our visitors I-X Indoor Amusement Park coupons and specials can change without notice. So please visit their official website to make sure of the latest pricing and coupons.